Aiseesoft Mac Total Media Converter Platinum can help users convert DVD/video/audio to all popular video(MPG, MPEG-1, MPEG-2, MPEG-4, H.264, H.264/MPEG-4 AVC, AVI, DivX, FLV, TS, MP4, XviD, M4V, MKV, MOV, 3GP, 3G2, MTV, SWF, WMV, ASF, DPG, DV, VOB, AMV, WebM, HD) and audio(AAC, AC3, AIFF, AMR, FLAC, M4A, MKA, OGG, WAV, WMA, MP2, MP3, AU) formats on Mac. Also it enables users to convert DVD/video to FLV 3D videos, MP4, MKV, TS and AVI. Plus, it supports iPhone 5 and iOS 6 now. 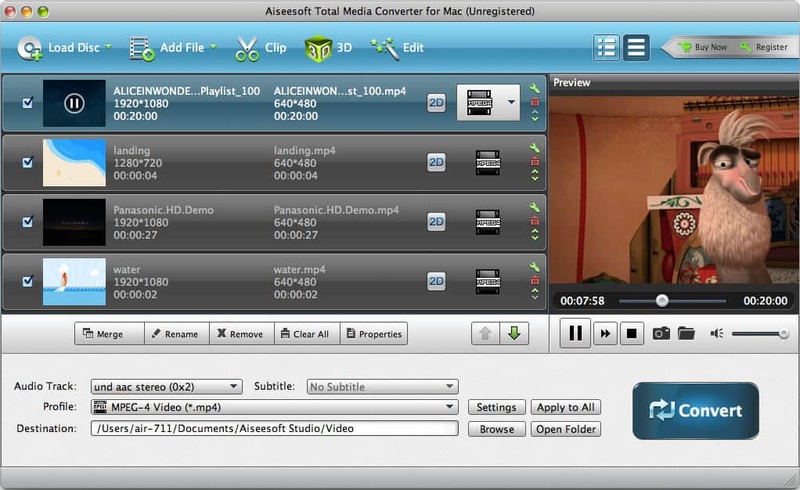 Aiseesoft Mac Total Media Converter Platinum can help users convert any DVD/video to Anaglyph (Red/cyan), Side By Side (Full), Side by Side (Half-Width), Top and Bottom (Full), Top and Bottom (Half-Height) 3D video. You can trim any time-length clips, crop video play region, add image or text watermarks, and merge the separated files into one. Setting video Encoder, Frame Rate, Video Bitrate, you can get customized video quality. You can also set Audio Encoder, Sample Rate, Channel and Audio Bitrate. You also can input your own resolution. This Mac Total Media Converter Platinum enables you to adjust output video effect like brightness, saturation, contract, hue, and volume. Meanwhile, the "Deinterlacing" function could help you convert the interlaced video to a progressive one for better quality. During your adjusting the output video, you are allowed to view the effect of both the original and converted file in the same window at the same time. Friendly user-interface and professional conversion technology makes the operation much easier.